Pastor David Jeremiah is one of my favorite Bible teachers and the one ministry on TV that I watch most weeks. His books have been favorites and this one is no different. 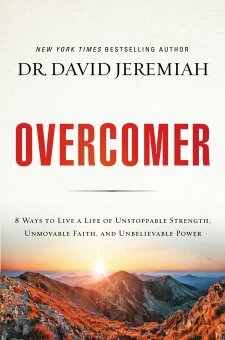 The subtitle of Overcomer is: 8 Ways to Live a Life of Unstoppable Strength, Unmovable Faith, and Unbelievable Power. Overcomer is written with a combination of a Scriptural foundation, stories from the Bible, excerpts from other books, examples from people he knows, and stories from his own life's journey. This book is easy to read while the content has seriously good Bible teaching, which can cross most Evangelical denominational lines. I thoroughly recommend Overcomer to anyone who appreciates sound Biblical teaching within an easy to read format. This book was provided by the publisher for the sake of review but the opinions are my own. Further information about the book can be found... here. Further information about the book and DVD combination can be found... here. We've been watching him also. I enjoy when we get to see his church and the singing going on before he preaches. We watch Dr. Jeremiah on TV every Sunday morning while we are eating breakfast and getting ready for church (along with Dr. Michael Youseff and Dr. Charles Stanley). Dr. Jeremiah's book looks good. Thanks for the overview.